Ireland's government on Tuesday approved the full excavation of a mass grave of infant and children's remains on the site of a former Catholic home for unmarried mothers. Significant quantities of baby remains were discovered in an apparent makeshift crypt in the town of Tuam in western Ireland during test excavations between 2016 and 2017. "I am committed to ensuring that all the children interred at this site can have a dignified and respectful burial," children's minister Katherine Zappone said in a statement. "It is only by taking the right actions now can we truly demonstrate our compassion and commitment to work towards justice, truth and healing for what happened in our past and, most especially, for those who were previously abandoned." 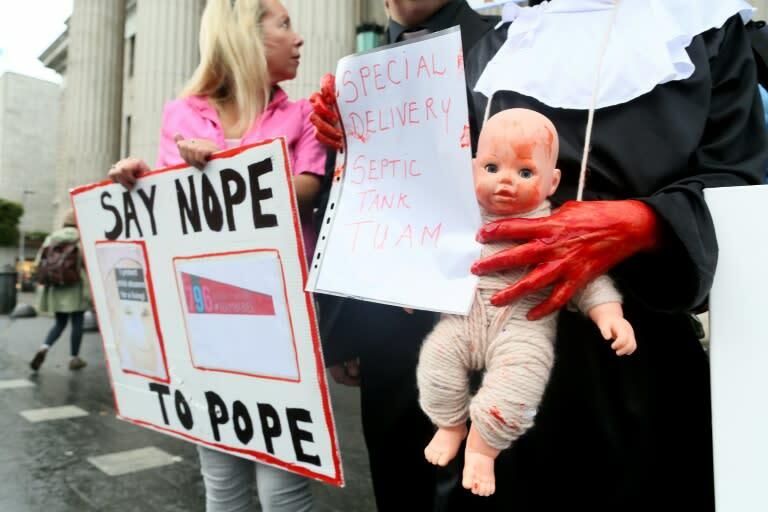 During Pope Francis's August visit to Ireland the so-called "Tuam babies" became an emblematic issue among protestors, representing historic abuses by the church in Ireland. Many demonstrators carried infant shoes at events during the Pope's weekend-long visit in a bid to evoke the grave and a silent vigil was held in the town. In addition to uncovering and re-interring child remains, the investigation will attempt to identify those buried at the Bon Secours Mother and Baby Home and make provisions for their memorialisation and conservation of the site. Initial investigations will focus on remains found in at least 17 of the 20 chambers examined so far. Eight separate areas warranting further investigation have also been identified, the government said in a statement. "It has taken us more time than first anticipated to examine the unprecedented technical and legal issues which arise in seeking to appropriately respond to the tragic discovery," Zappone added in her statement. The government-sanctioned commission was set up following research by a local historian, Catherine Corless, who found that 796 babies and children died at the home between 1925 and 1961 but there were no burial records for them. She has always maintained they had been buried at the site. Contested reports that infant remains were discovered in sewage chambers have also heightened outrage around the discovery.